The latest edition of anti-Brexit newspaper The New European has taken inspiration from Protein World's notorious "Beach body ready" ad, with a cover referencing the debate on post-Brexit food regulations. 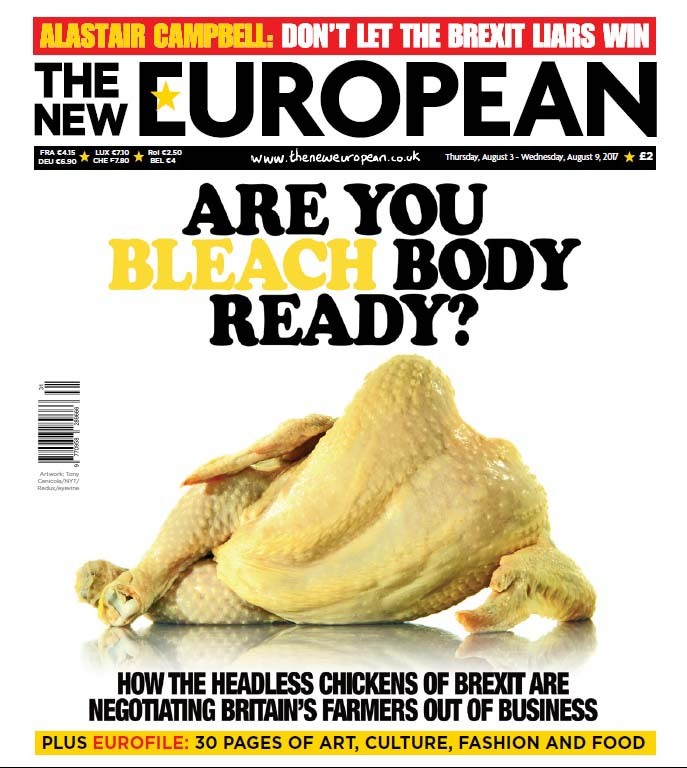 The cover features a headless plucked chicken arranged to echo a come-hither reclining pose, with the headline "Are you bleach body ready?" The question refers to the suggestion, posed by some Brexit supporters, including international trade secretary Liam Fox, that the UK should be ready to change its food production regulations after Brexit in order to facilitate a free trade deal with the US. In the US it is common for chickens to be treated with chlorine, a practice that is banned in the EU. The issue of The New European is available from today. The paper's editor, Matt Kelly, said: "The chicken photo was done six or seven years ago by the New York Times - I've always loved it and when the chlorinated chicken story came up I thought there was a chance to use it. "Chris Barker [designer] came up with the headline. It was what made the whole thing work as it was quite hard explaining why the chicken was posed up as it was. The two things clicked into place very well." Protein World’s poster, which appeared on London Underground sites in 2015, was banned by the Advertising Standards Authority over health and weight loss claims made in the ad. The watchdog later ruled that the ad was not offensive. But last year, newly elected London mayor Sadiq Khan moved to ban ads that promoted "unhealthy or unrealistic body images" on Transport for London sites.